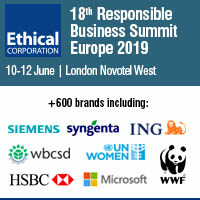 March 19, 2019 /3BL Media/ - New speakers have joined the 18th annual Responsible Business Summit Europe (10-12 June, London) with the aim of share and identify new strategies to achieve sustainable development, as well as to find partnerships and innovations to lead on environmental and social issues whilst delivering greater transparency on your climate and reputational risks. The latest agenda, along with the up-to-date speaker line-up, can be seen here. The Responsible Business Summit Europe is the premier platform where senior practitioners from across the country meet and share practical ideas on how their businesses can lead the change to a new sustainable future. More information about the event can be found here. Currently, passes for the event our discounted by £300. To confirm a place at next year’s event click here. For further details contact Candy Telani Anton at candy.anton@ethicalcorp.com or call +44 (0) 207 375 7162. Ethical Corporation’s mission is to help businesses around the globe do the right thing by their customers and the world. We believe this is not only how to ensure a future for all but makes good business sense. We serve CSR, compliance, risk and governance communities with topical and insightful business intelligence and meeting places.